Israel on Saturday rejected a request by the United Nations for a three-day cease-fire in Lebanon to get in supplies and allow civilians to leave the war zone. Avi Pazner, a government spokesman, said Israel already has opened safe corridors across Lebanon for such shipments and that Hezbollah guerrillas were blocking them to create a humanitarian crisis. "There is no need for a temporary, 72-hour cease-fire because Israel has opened humanitarian corridors to and from Lebanon," he told reporters. "The problem is completely different. It is Hezbollah who is deliberately preventing the transfer of medical aid and of food to the population of southern Lebanon in order to create a humanitarian crisis, which they want to blame Israel for." Jan Egeland, the U.N. humanitarian chief, on Friday called for a three-day truce between Israel and Hezbollah to evacuate trapped civilians and replenish supplies to areas cut off by the fighting. He said thousands of children, elderly and disabled had been stranded after more than two weeks of fighting, while supplies of food and medicines were dwindling. At least 445 Lebanese, most of them civilians, have been killed in the offensive which began after Hezbollah kidnapped two Israeli soldiers and killed three others in a cross-border raid on July 12. Thirty-three Israeli soldiers have died in fighting, and Hezbollah rocket attacks on northern Israel have killed 19 civilians, the Israeli army said. Thousands of foreigners already have been evacuated from Lebanon by countries such as the United States, France and Britain, using planes and ships. The U.N. already has observers in southern Lebanon, but they and the Lebanese government have not been able to disarm militias such as Iranian-sponsored Hezbollah, as required by U.N. Resolution 1559. Pazner said a new multinational force has to be given a real mandate. "It has to be a force that has a clear mandate to prevent the Hezbollah from firing rockets into Israel and to prevent all terrorist attacks on Israel. It has to be composed of countries that are ready to send real soldiers in order to keep the peace," he said. The new force can't be similar to the U.N. observers "who now do very little to prevent attacks by Hezbollah," he added. Olmert met Saturday with Chief of Staff Lt. Gen. Dan Halutz, Defense Minister Amir Peretz and other senior security officials to discuss Israel's strategy in the Lebanese offensive, which has involved thousands of attacks by its air force on Hezbollah targets and infrastructure in Lebanon and ground fighting in several villages in southern Lebanon. Israeli planes flew 120 missions against targets in Lebanon over a 36-hour period to Saturday morning, destroying a bridge in a resort area near the Syrian border, as Hezbollah guerrillas escalated their attacks. After two air raids destroyed the bridge over the Orontes river in the northeast. Residents said there were no casualties in the attack over the Orontes in the Bekka Valley. A U.S. Navy high-speed HSV-2 catamaran arrived at the Beirut port Saturday from Cyprus bringing 20,000 blankets, 1,000 tarpaulins, large medical kits and other materials for immediate distribution, said Cassandra Nelson, a spokeswoman for the international aid organization Mercy Corp. She said the materials will be sent to the mountainous Chouf area east of Beirut, where the group has assisted refugees. CBS News national security correspondent David Martin reported that Israel has made so little progress (video) in destroying Hezbollah that some U.S. intelligence analysts now say the attempt to create a buffer zone in southern Lebanon has bogged down. "It doesn't appear they've been able to claim the territory they want to claim," one intelligence official told Martin. A Middle East policy analyst said that that he thinks the United Nations has a chance of producing a resolution (video) that can lead to a cease fire. "There's been a surprising amount of agreement about the elements that would go into a cease-fire package," Martin Indyk, director of the Saban Center for Middle East Policy at the Brookings Institution and former U.S. ambassador to Israel told to CBS Evening News anchor Bob Schieffer. Pro-Lebanon protesters mobbed Australia's prime minister Saturday in violent clashes with police, condemning his support for Israel and demanding more effort to bring peace to the Middle East. Prime Minister John Howard was leaving a state conference of his Liberal Party at a hotel in the western city of Perth when about 200 protesters of Lebanese descent and others broke through a police cordon to mob his car, many chanting "shame," local media reported. U.S. Secretary of State Condoleezza Rice said Saturday that the Lebanese Cabinet's new proposal to end the fighting with Israel is evidence the young democracy can function like a healthy government. Rice was on her way back to the Middle East for diplomatic discussions aimed at ending the violence there. "The most important thing that this does for the process is that it shows a Lebanese government that is functioning as a Lebanese government," Rice told reporters traveling with her. "That is in and of itself extremely important." After Rice's arrival in Jerusalem later Saturday, she was expected to meet with Olmert and Foreign Minister Tzipi Livni, according to a senior U.S. State Department official who requested anonymity. In Beirut, Hezbollah politicians signed on to a proposed peace package that includes strengthening an international force in south Lebanon and disarming the guerrillas, the government said. The agreement, reached at a Cabinet meeting, was the first time Hezbollah had agreed to a proposal for ending the crisis that includes the deploying of international forces. However, Hezbollah fighters said they were now using a new, more powerful rocket in their attacks. And Israel on Saturday rejected a U.N. request for a three-day cease-fire to deliver humanitarian supplies to Lebanon and allow civilians to leave the war zone. The Lebanese proposal falls short of American and Israeli demands in that it calls for an immediate cease-fire before working out details of a force and includes other conditions. "Everybody knows this is a complicated coalition," said Rice, praising Lebanese Foreign Minister Fuad Saniora. "That he is able to go back and bring his government together around a way forward is very encouraging." The Lebanese plan overlaps with agreements reached in Rome by foreign policy leaders gathered to address the violence between Israel and the Hezbollah militia, Rice said. Hundreds, mostly Lebanese civilians, have died in the fighting. The U.S. and Israel say any agreement must try to resolve regional disputes that have flared for decades. The position conflicts with many U.S. allies. Rice has said that other governments agreed with her during the closed session of diplomats in Rome, but she declined to name them. 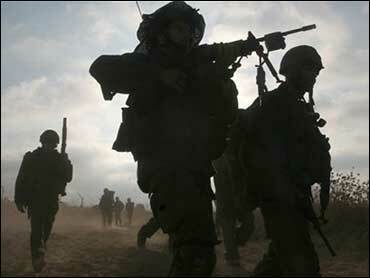 Fighting between Hezbollah's guerillas and Israel exploded after Hezbollah's July 12 raid into Israeli territory. Two Israeli soldiers were killed. Israel says their release is pivotal to ending the current crisis. Rice renewed her call for their release. She said she would not set deadlines for reaching any international agreements or say how close Israel is to achieving its strategic goals for dismantling Hezbollah, its leading justification for the recent fighting.